This weekend, I’ve been part of one of those experiences that just cements my idea of how crucial my PLN and online learning in general are. As usual, I didn’t scrape up the funds to make it to ISTE in Atlanta, but knew that there would be some sort of online opportunity for learning. This is where I was #NotatISTE14 most of this weekend! Gone are the days of yesteryear though, when ISTE webcast their keynotes and shared out sessions for those educators not able to be there in person. 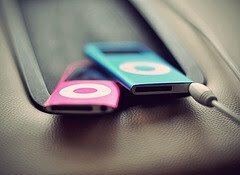 THOSE days are over! I even considered paying for the virtual pass so that I could participate a little bit–but that seemed fairly expensive, and I wasn’t convinced that it would yield that much learning. Then came Jen Wagner’s tweet, the hashtag and a G+ community! Now, I’ve not yet made complete friends with G+, but I figured as long as Jen was there, she would help me if I needed it! From that community has come a wonderful weekend experience of learning and connecting with a completely different set of folks than I usually run into online! We all joined a Voxer community, which is a tool that I’ve used just a little bit personally, but haven’t ever used in a group. I was ready to see it in action with a large group, and it has been an interesting experience! I’m wondering if I could talk some of my colleagues into participating with me in one next year. Sometimes I feel like these tools are a hard sell for busy teachers, even if they might make their lives easier and richer! Anyway, now I have an example of how it worked. So that is a big win! After the nitty-gritty of setting up the community, Jen (being Jen) got down to the fun stuff and we all created #NotatISTE14 name badges, complete with ribbons. She set a list of challenges to all who wanted to participate. The weekend was off to a great start! Vicky Sedgwick posted a (much better) overview of our #NotatISTE14 experience, and did Ann Oro’s reflections from today are insightful too. The real learning piece came in with Jeff Bradbury’s TeacherCast Live webcast. For three hours each morning, he’s interviewed amazing and inspiring leaders in education and tech, like Angela Maiers, Todd Nesloney, Steve Hargadon, Adam Bellow, Steve Dembo, the EduVue ladies and Paula Naugle. And there’s more tomorrow! As always, his interviews were easy going and fun, but filled with great information for all of us watching. He even surprised everyone’s favorite mentor, Peggy George with a tribute honoring her for her uncanny ability to make all of the Internet (educators, at least) feel welcome and empowered and ready to learn! Glad I was “there” to take part in that! I know that, among the people that I’ve spent my weekend with, I am far from the most adventurous online learner or leader out there! I’m a real outlier! However, this type of learning is so valuable to me, and it recharges me in a way that I wonder how I did things before online communities! Among the teachers that I know in real life, so many of them have no inkling that this kind of community learning even exists! I’ve had little success in spreading my enthusiasm to my own local colleagues, and it is such a frustration to me! This situation is, of course, complicated by the roadblocks….oops….I meant safeguards…that our district employs on our network. It is very difficult to encourage professionals to even begin seeking a rich online PLN when the very tools that are required to do that can’t be used at school. The audience is lost before we begin! But that’s another rant, I guess. Today, I’m just thankful that I’ve been at home #NotatISTE14 , and that I’ve had the opportunity to learn and play online with such amazing and dedicated educators! It’s been an experience that I know I will draw on in the months to come. Thanks friends! I’ve read Jeff Utecht’s blog, The Thinking Stick, for a long time. I follow him on twitter. He’s one of the many amazing people that I think of as my Personal Learning Network. SO, I’m very proud to have his new (and first, I think) book on my shelf! I bought a copy of Reach: Building Communities and Networks for Professional Development, even though he very graciously allowed free downloads for the first few days of publication. I did that too, but thought that it was only right to support the effort of a member of my PLN. I’m glad I did, too! Although I was familiar with many of the tools and techniques for creating a PLN that Utecht focuses on, I found that his book provides the basis for a great “how and why to start” discussion. Reach is a book that I definitely plan to share this year with faculty members. Utecht explains how to find people to follow on sites like Twitter and Facebook, how to use RSS to make it easier to connect to your “tribe,” and more! It’s the why and the how of building a professional learning network or community online–and it’s a very hands-on, practical approach. I think that it will be helpful to many of my colleagues who might be just about ready to begin reaching out for professional support, and building a unique community of learners for themselves. It could form the basis for a great PD series too, if I can find some teachers in my world that are ready! Thanks Jeff for your work in writing this book, and for so freely sharing with your network! Right now, just about any media outlet, product, celebrity or local business seems to have their Twitter name prominently displayed, yet in my everyday life, almost everyone thinks I’m a bit…odd…to even bother with twittering. I think this is so odd, because some of my most valuable professional colleagues are people in my Twitter network! I find useful websites, I get great ideas to try with our students, I discover articles and current research or advocacy tips–all from this valuable network of people that I’ve cobbled together for myself on Twitter. I’d say it’s the most valuable tool I have in my toolbelt! There’s great comfort in finding that I’m not the only one in the world that spends time thinking of things like core common standards vs. AASL standards or “new and emerging tech to promote reading,” which brings me to an important point! As has been said many times over, the reason that most people who try but end up being puzzled and disdainful of Twitter is that they do not have a relevant group of people to share with & learn from. Hashtags help with this dilemma, and for the teacher librarians out there, Joyce Valenza’s suggestion of using #tlchat could make the difference! Go to Twitter.com and type #tlchat in the search box. You don’t even need to log in! 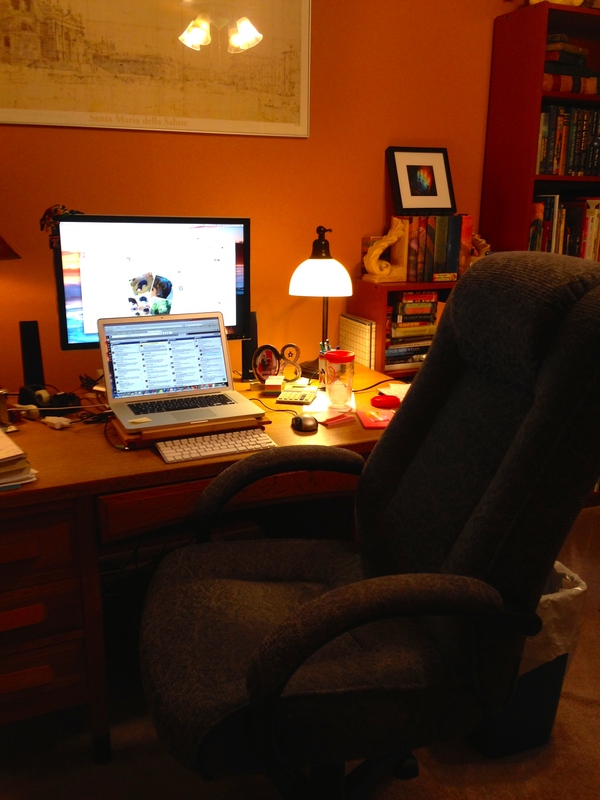 Up pops a list of recent tweets by teacher librarians about….library-ish stuff! At right, look at a typical example of tweets–they’re from tonight. There are so many links to be found that you could easily lose an evening just learning. 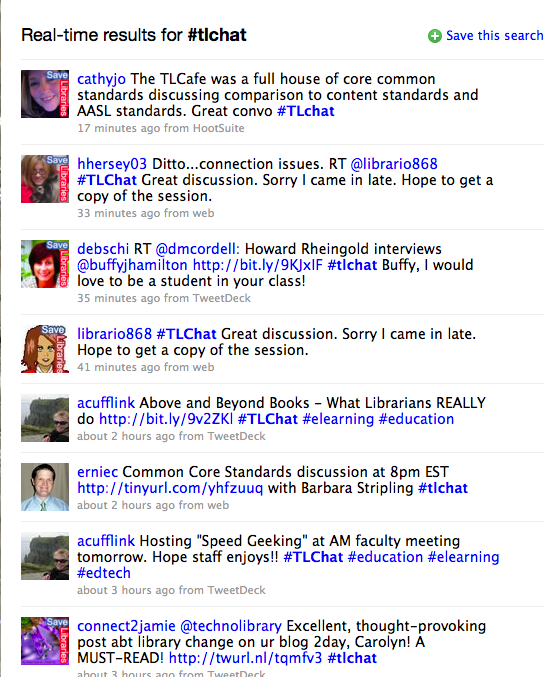 Then, once you see who is tweeting with the #tlchat hashtag, you will have a number of interesting people to follow! Once you find a few people to follow, you can see who they follow, and you are on your way to building your own network! Wildly valuable, and quite addictive….